So I was in one of those weird moods today, and that is all I needed to whip up this salad. I opened the fridge, stood in front of it, till it started beeping. Pulled out a few items and off I went to the kitchen [yes, at grandparents house, the fridge is not in the kitchen] This is what I whipped up.. Taste and add seasoning/spice depending on your preference. It was absolutely yummy. So fresh, crunchy and delightful. 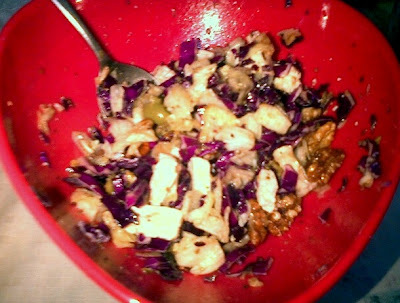 Purple cabbage, more commonly known as red cabbage, is a colorful variety from the brassica family. Purple cabbage has a relatively high ratio of nutrients and vitamins to calories and fat, which makes it an ideal choice for dieters. It is common in salads, coleslaw, braised dishes and pickled treats. 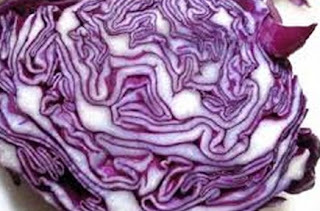 The vitamin and mineral content of raw purple cabbage is the most significant reason to consume this vegetable. A single serving of raw purple cabbage contains about 20 percent of your DRI for vitamin A, at 993 international units. It also contains around 80 percent of your DRI for vitamin C at 50.7 IU per 1-cup serving. Other vitamins and minerals in a 1-cup serving include notable levels of folate and vitamin K; 40 milligrams of calcium; 14 milligrams of magnesium; and 216 milligrams of potassium. Cabbage is a great store of vitamin C and vitamin K. The rich deep colour of this vegetable is due to a high concentration of anthocyanin polyphenols (strong dietary antioxidants, possessing anti-inflammatory properties), making it have even more phytonutrients than a green cabbage. A few studies also show that anthocyanins may help reduce the risk of heart disease, diabetes and certain types of cancer. It is rich in anti-oxidants which makes skin supple and clear.